This year IEEE VIS (the conference formerly known as VisWeek) 2015 takes place in Chicago, also known as the “Windy City”. 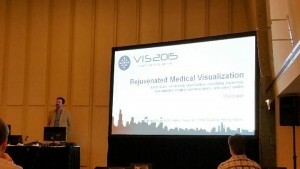 On the first day, I attended a very interesting tutorial about medical visualization entitled “Rejuvenated Medical Visualization”. This tutorial was opened by Steffen Oeltze-Jafra, the organizer of this event. He welcomed the audience and introduced the other speakers in the tutorial: Anders Ynnerman, Stefan Bruckner and Helwig Hauser.